It seems Qatar monarchy has finally realized that it’s better to part with anti-Iran Saudi ‘royals’ and their regional allies. Western-controlled Saudi and UAE poodles have spent the past few days irritated over the ruler of oil-rich Qatar, Sheikh Tamim bin Hamad Al Thani’s receiving phone call from Iran’s re-elected president Hassan Rouhani. “One of our foreign policy principles is to continue cooperation with neighboring countries in the Persian Gulf. We believe the two sides can remove existing barriers and boost fraternal bonds through strong will,” the state news agency IRNA quoted Rouhani as telling Tamim bin Hamad al-Thani late on Saturday. 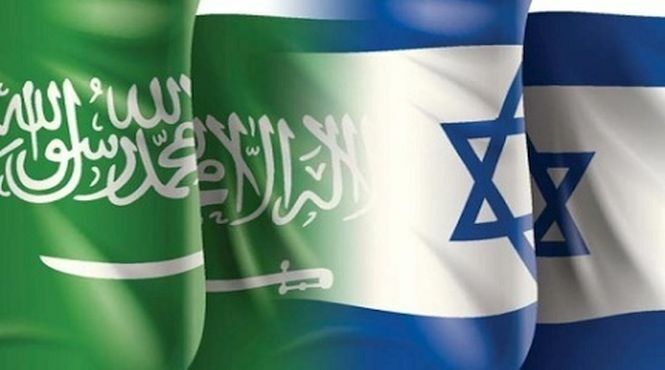 Two days later, Iran’s Supreme Leader Ayatullah Ali Khamenei blasted Saudi ‘royals’ over their close relations with two great Satans, Washington and Tel Aviv. 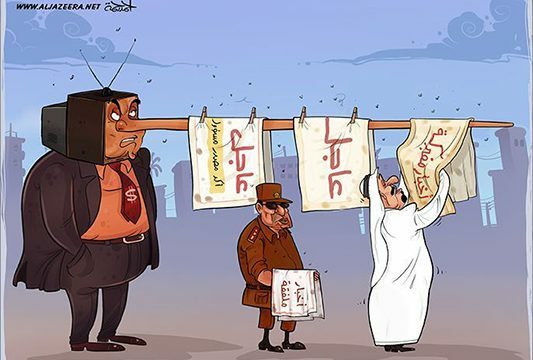 As that was not enough, on May 28, Qatar-based Al-Jazeera channel posted a cartoon (see below) mocking Saudi King Salman and Egyptian dictator Gen. Abdel Fattah al-Sisi, a Crypto Jew. Both leaders are anti-Iran, anti-Hamas and pro-Israel. The cartoon was eventually removed by the network. So far Qatar, Kuwait and Oman have maintained their neutrality in Saudi Arabia’s proxy wars in Syria, Yemen, and Bahrain for Israel. Riedel also said that the 39-member Sunni Muslim NATO lead by Saudi Arabia is basically to fight Iranian influence in the region. After Trump visit to Saudi Arabia and his anti-Iran rants – Pakistani media has reported that the head of Muslim NATO, Pakistan’s retired Gen. Raheel Sahrif plans to quit the post as he fears the military alliance has become a sectarian tool in the hands of Arab Sunni rulers. “The terrorists are the foot-soldiers of the Western military alliance. Al Qaeda is a creation of the CIA. The Islamic State (ISIS-Daesh) was originally an Al Qaeda affiliated entity (Al Qaeda in Iraq) created by US intelligence with the support of Britain’s MI6, Israel’s Mossad, Pakistan’s Inter-Services Intelligence (ISI) and Saudi Arabia’s General Intelligence Presidency (GIP),” says Canadian professor Michael Chossudovsky with Jewish family roots (here).